Glasgow, Scotland – There is an old adage that in Glasgow, Labour votes are weighed not counted, such is the party’s historical dominance of Scotland’s largest city. Labour has controlled Glasgow city council for all but five of the last 63 years. All seven Glasgow MPs were elected with a red rosette pinned to their lapel. But there are signs that Labour’s supremacy in Glasgow – and Scotland – could be coming to an end, with huge repercussions for the whole of the United Kingdom. In the 2010 general elections, Labour won 42 percent of the vote in Scotland, and up to 68 percent in some Glasgow constituencies. But recent polls put the Scottish National Party (SNP) on course to win a crushing victory in May’s UK vote, ending Labour’s monopoly on power north of the border and jeopardising Labour leader Ed Miliband’s prospects of becoming prime minister. Glasgow Central is the kind of seat Labour once held almost without trying. A diverse constituency taking in the luxury flats of the Merchant City and the tower blocks of the Gorbals, Glasgow Central has been united by one factor – Labour. In the last general election, Labour’s Anas Sarwar won more than half the vote. People in Glasgow have voted Labour for generations and finally they are starting to wake up to the fact that the Labour Party are not the party they thought they were. In Glasgow Central, the SNP polled barely one-third of the Labour vote in 2010. A recent poll, however, puts the nationalists 10 points ahead in the seat. “People in Glasgow have voted Labour for generations, and finally they are starting to wake up to the fact that the Labour Party are not the party they thought they were,” said the SNP candidate, local councillor Alison Thewliss. The most obvious reason for this dramatic turnaround is September’s independence referendum. Although Scotland voted to stay in the United Kingdom, every constituency in Glasgow voted to leave. Labour was at the forefront of the pro-union “Better Together” campaign, but some 190,000 Labour supporters backed independence. Most are now expected to vote Scottish nationalist, turning a raft of once-red Labour heartlands to SNP canary yellow. “People say Labour ganged up with the Tories during the referendum. That has really sickened them,” said Thewliss. Defeat for Labour in seats such as Glasgow Central would make the task of winning control in Westminster much more difficult. But on a cold weekday afternoon, there is little enthusiasm for the traditional party. “I’m voting SNP. Labour seems to have the same policies as the Tories,” said a middle-aged Asian man, who requested anonymity, in Govanhill, home to one of Scotland’s largest immigrant communities and once a bedrock of Labour support. 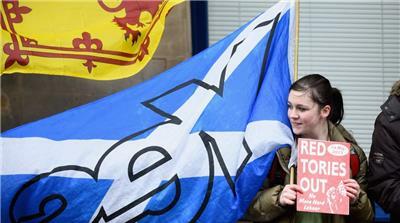 Even those who voted “no” to independence are uncertain about Labour. “I always voted Labour – but not now,” said Anne, who returned home to Glasgow six years ago after several decades in Canada. She said she likes SNP leader Nicola Sturgeon, but “cringes” when she watches Ed Miliband on television. Across Scotland, Labour faces similar problems. The SNP enjoy leads of up to 20 points in the polls. Recently elected Scottish leader Jim Murphy has not brought the electoral bounce many expected. Ed Miliband has refused to rule out a deal with the SNP after the general election, much to the chagrin of many of Labour’s 40 Scottish MPs who face being washed away in a nationalist tsunami on May 7. Writer Gerry Hassan said the stark decline of Labour in Scotland has deeper roots than just their alliance with the Conservatives in last year’s referendum campaign. In an upmarket café on the edge of Pollokshields East, one of Anas Sarwar’s strongest areas in the constituency, the author of The Strange Death of Labour Scotland explained: “This is a long-term thing. Getting into bed with the Tories has hurt Labour, but it’s not the biggest thing. Labour has failed to appreciate that most Scots actually like the SNP, said Hassan. “Ever since the modern SNP was created, around 1974, opinion polls have shown that Scottish people have a positive view of the SNP. Glasgow and Labour have long been synonymous in the Scottish political psyche, but Hassan said the party’s grip on the city has often been more imaginary than real. “I don’t think there ever was a golden age for Scottish Labour. The Labour vote has died and moved,” said Hassan, citing the halving of Glasgow’s population since World War II, and dwindling election turnouts. Labour’s Anas Sarwar succeeded his father Mohammad, Britain’s first Muslim MP, in 2005. The 32-year-old dentistry graduate said he is “confident, not complacent” of holding his seat in two month’s time. Sarwar’s pitch is an unambiguous one – vote Labour to keep the Conservatives out. The Tories, who draw most of their support in the south of England, are unpopular in Scotland, and practically toxic in Glasgow. Just one of Glasgow’s 79 councillors is Conservative. “I know a Tory government is bad for Glasgow. I know what Glasgow needs is a Labour government, not a Tory one, and I want to make sure by accident that we don’t end up a Tory government,” said Sarwar. But Cass MacGregor, Scottish Greens candidate in Glasgow Central, said voters are “fed up” being told to back Labour to keep the Tories out. “People have to vote for what they believe in. Trying to vote based on the people you don’t want to win is what has got us into this mess in the first place,” said MacGregor. The Greens are unlikely to win but could attract plenty of support, particularly from students in a constituency that includes a large student body. Alex Mosson is testament to how much politics in Glasgow has changed. The former Lord Provost spent 23 years as a Labour councillor in the city, but no longer backs the party he joined as a Clyde shipyard worker in 1978. “A lot of people have lost faith in the Labour party,” said Mosson, who left the Labour party and voted for independence last year. “They want someone who speaks for their views. There has been a sea-change in people’s thinking. Whether this shift will be enough to deliver a sweeping SNP victory in May remains to be seen, but one thing seems certain – the days when scales were needed to tally Labour votes in Glasgow are coming to an end. As September’s referendum on Scottish independence from the United Kingdom draws closer, Mr. Cameron is becoming increasingly concerned about a burgeoning shift among Scots towards the pro-independence side, which prompted a rare visit to Scotland today to press the unionist case in person. But observers warn that the Conservative prime minister may be in a no-win situation north of the border, where he crystallizes Scotland’s nationalist and anti-Tory sentiments while not yet offering a constructive alternative to undecided Scottish voters. But his appearance in Scotland’s largest city was a low-key affair – hardly surprisingly given his party’s travails in Scotland. The Tories, the largest party in England, holds just one of 59 Scottish seats in the UK parliament at Westminster. Many Scots still blame Margaret Thatcher for the deindustrialization that ravaged many Scottish cities. When the former Conservative leader died last year, hundreds attended a celebratory street party in Glasgow’s main square. Although polling has consistently put the unionists ahead so far, there has been disquiet about Better Together, the cross-party “No” campaign supported by Conservatives, Labour and the Liberal Democrats. Opponents of independence have been accused of relying on a lugubrious message and of failing to make a compelling case for maintaining the union. Recent reports that Westminster suppressed the findings of a government-funded opinion poll thatindicated a rise in nationalist sentiment have fed this narrative. Bane or boon for the “no” vote? But with the Sept. 18 vote to end the Union of 1707 only months away, Cameron is caught in an awkward position when it comes to Scotland, says James Maxwell, a Scottish political commentator at the New Statesman. Cameron has consistently rejected calls from Yes Scotland to participate in a live TV debate with SNP leader Alex Salmond. Some, like Arthur Midwinter, visiting professor of politics at the University of Edinburgh, believe that Cameron should go further and keep out of the independence campaign completely. But the prime minister’s visit could end up benefiting both sides in the independence debate, says Alex Massie, an experienced watcher of Scottish politics and a commentator for the Spectator.